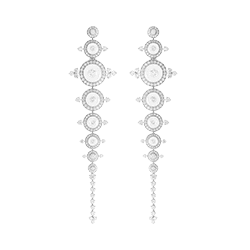 Thank you for visiting www.boucheron.com (hereinafter referred to as the "Site"). READ THE FOLLOWING INFORMATION CAREFULLY BEFORE USING THE SITE. The use of and access to the Site are governed by these legal Terms and Conditions. If you disagree with any of these Terms & Conditions, please exit the Site immediately. Your use of the Site is subject to the following terms and conditions (hereinafter referred to as the "Terms & Conditions"). The fact of using the Site implies that you agree to comply with and be bound by these Terms & Conditions, the confidentiality rules and the online selling conditions when you make an online purchase. Boucheron may from time to time modify these Terms & Conditions at its entire discretion. The fact of using the Site after said modifications implies that you agree to comply with and be bound by these modified Terms & Conditions. 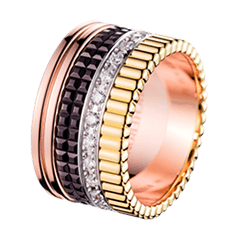 The Website is operated by the Boucheron SAS which belongs to Boucheron Group. 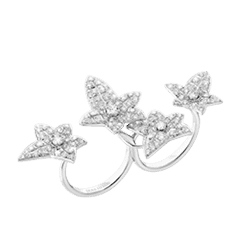 This Site and its contents are protected by copyright, trade marks and/or other intellectual property rights and are the exclusive property of Boucheron or are used with the permissions of their owners. Such content includes but is not limited to, all photographs, images, illustrations, texts, multimedia (graphic, audio and video), logos as well software used for the design and the function of the Site. 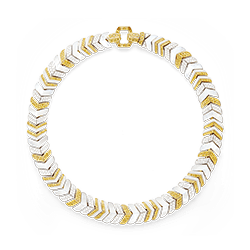 All trademarks displayed on the Site are trademarks of Boucheron. All rights are reserved worldwide. 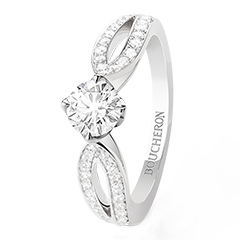 All intellectual property rights related to Items created with the "personalization" are and shall remain owned by Boucheron. The data contained on this Site is presented for information and promotion purposes only. This Site is intended solely for private, personal and non-commercial use. You may download or reproduce information appearing on this Site solely for personal and non-commercial purposes. The downloading or reproduction of any document or software gives you no right, title or interest with respect to such documents or software. With the exception of personal and non-commercial use, you are prohibited from reproducing, publishing, transmitting, disseminating, displaying, erasing, deleting, adding to or modifying in any way whatsoever, creating derivative works from, selling or participating in the sale of any part of this Site, any material contained on this Site or any related software. Any other use of the content of this Site, including its reproduction for purposes other than your personal non-commercial use, modification, dissemination or reproduction, without Boucheron's prior written consent, is strictly forbidden. You hereby agree that all comments, suggestions, drawings, concepts, photos, testimonials, and all articles or documents (except for the private information concerning you) communicated or entrusted to Boucheron through this Site or by any other means (hereinafter referred to as the "Suggestions") shall not be deemed as confidential and shall not be your property. All Suggestions shall automatically become the property of Boucheron as soon as they are made. The fact of making a Suggestion shall transfer to Boucheron all rights, titles and interests, including the copyrights, linked to the Suggestions. Boucheron has no obligation (i) to preserve the confidential nature of any Suggestion; (ii) to financially compensate anyone in exchange for or in connection with a Suggestion; or (iii) to reply to or acknowledge receipt of any Suggestion made to it. You hereby assert and guarantee that none of your Suggestions infringe on the rights of a third party, with respect to copyright, registered trademarks, patents, trade secrets, private life or any other personal or property rights. By making a Suggestion, you acknowledge that Boucheron can (but is not obliged to) copy, publish, disseminate or use this Suggestion for any purpose, including, but not limited to, advertising, promotional or product development purposes or any other commercial purpose, without any financial compensation being payable to you or any other person. You are and shall remain liable for the content of any Suggestion made by you. This Site may contain links to other Internet sites. Boucheron shall not be held liable for the availability or content of such sites or any article contained on or obtained through such sites. Any link to another site or any reference to information, products or services supplied by third parties, in no way imply that Boucheron has given its approval concerning those sites or articles. Any question or comment concerning any other site must be sent to that site's operator. 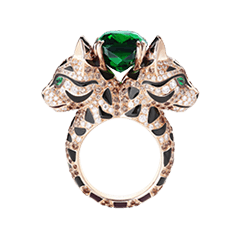 No link with the Site is authorised without Boucheron's prior written approval. 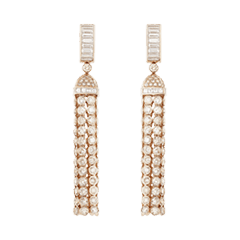 The Boucheron products featured on the Site are representative of Boucheron's collection. 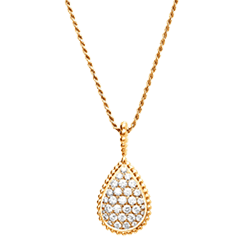 However, not all Boucheron products are featured on the Site. 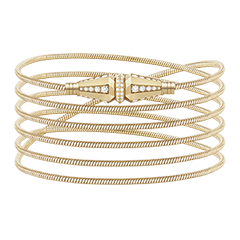 Not all products featured on the Site are available in the Boucheron shops. The style drawings, models, and colours of the Boucheron products featured on the Site may be modified without prior notice. Prices are provided for information only, they have no contractual value and are subject to modification. This Site and its contents are provided "as is" and "within the limit of their availability". Boucheron shall not be held liable and provides no guarantee of any kind, whether express or implicit, including any guarantee as to the title or the absence of malevolent programs (such as viruses, worms or Trojan horses) or implicit guarantee as to trade value or suitability for a particular use, and expressly disclaims all liability and all guarantee. Boucheron shall bear no liability and cannot guarantee that the information contained on the Site is accurate, complete and up-to-date, that the Site contains no defect and that any such defect shall be corrected. By using this Site, you agree to do so at your own risk and assume full responsibility for any impossibility to use the Site, any loss of data and the costs related to any assistance or repair of any hardware and/or software used by you for connecting to the site, and you agree to hold Boucheron harmless for any damage whatsoever that may be caused by, result from or be connected to your use of the Site. You represent, warrant and covenant that (a) you have the power and authority to enter into this agreement; (b) you are at least eighteen (18) years old; and (c) your use of the Site will comply with these Terms & Conditions. Boucheron shall under no circumstances be held liable for any actual, direct, indirect, special, punitive, incidental, exemplary or consequential damage, or any other damage, whatever its nature, even if Boucheron was previously informed of the possibility of such damage, whether during a contractual action, a prejudice or any other theory, resulting from, or connected to the use, incapacity to use or execution of information, products or documents on this Site. You hereby agree to defend, compensate and refrain from holding Boucheron, its subsidiaries and affiliated companies as well as their representatives, directors, employees and shareholders liable for any lawsuit, damages, losses, costs and expenses, including among other things any reasonable lawyers' fees and legal costs ensuing from or connected to the use of this Site. The content of this Site may contain inaccuracies or typographical errors. Boucheron shall not be held liable for any inaccuracy or error, or for loss or damage caused by or resulting from the use of information obtained on or through the Site. It is up to you to assess the information and any other content available on or through the Site. The Site and the information and articles appearing on it are liable to be modified at all times, possibly without further notice or advance warning. These Terms & Conditions have been written in French and are governed by French law. Any dispute shall be adjudicated by French courts.